Great innovations Dan et al. Dan, I had a great chuckle over your rope stuffed in to wrong hole. Thanks for all the looks at the custom tools. It helps to see how others use their knowledge to simplify their lives. Some very ingenius tools there guys, well done. A simple one from me, to knock the GL1500steering lowerbearingouter raceout of the tube. The bend and filed out notch in the baris to reach around the base where the bearing sits. You can use a long (well over a foot long) bent screwdriver,but they weren't growing on trees that day and nobody was volunteering to loan me one knowing it would very likelybe ruined. For me, a piece of scrap 8mm bar was simple andworked perfectly. One last thing on our safety man....I took several of my "home made" stuff to this chrome shop had them chromed and our "safety guy" never confiscated any of those tools....He thought they were factory made tools.... ....Like I said necessity is the mother of invention....When I left there I sold all my "specialty tools" to a new mechanic, he was going to need them.....Where would I need now a 5 foot long 2in combination wrench????? My Grandfather and his brother were tool and diemakers for Western electric, back before, during, and after the depression. When they needed tools, they made their own. All of them have the date made and their initials stamped on them. Fast forward to now, and they are family heirlooms. This is a good thread, some really inventive members here. Wish I could contribute to such a useful thread. But I can't even draw a straight line with Photoshop! My dad, however, after he retired from the ministry, started diddling around with antique clocks. He never purchased a special tool to work with the intricacies of these old clocks. 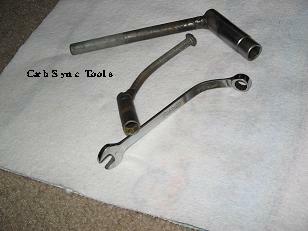 He always made his own out of the existing tools he had in his garage. Pretty soon, he received a visitor. It was the regional rep from Seth Thomas. Seems my dad had become so well known that they wanted him to become their regional repair rep. He turned it down because he just enjoyed doing it for the local people in South Alabama.